The Golden Blade Spark! Each year, the craftsmen, merchants and many crooks of Terrinoth unite under the protection of the Golden Blade. The Golden Blade Adventure Pack now invites your group of heroes to participate in the Festival and equip themselves for new adventures. This expansion offers a new hero for your Runebound games, as well as new Adventure, Resource and Skill cards with new Combat counters. Be careful this game is an extension of Runebound and cannot be played alone. 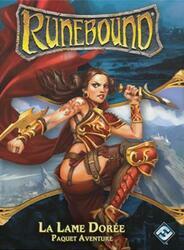 To be able to play it you must have a copy of the game Runebound .